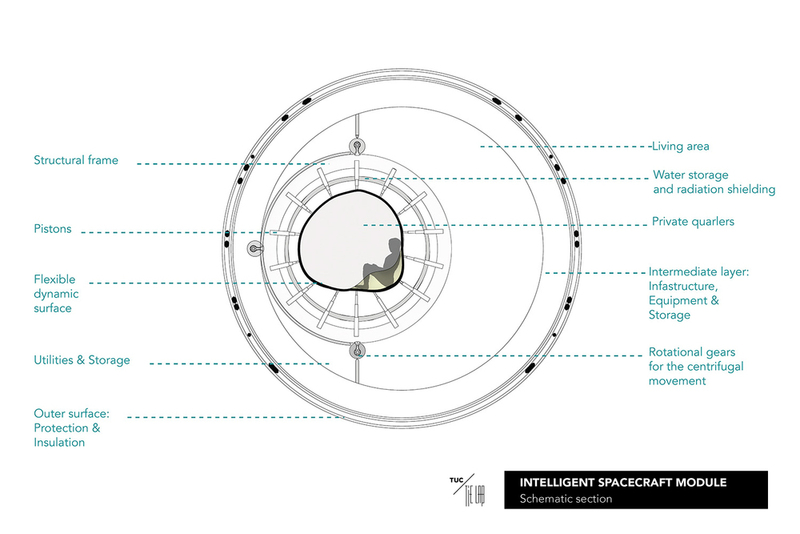 This project explores a human-centered design approach to a habitable spacecraft module. 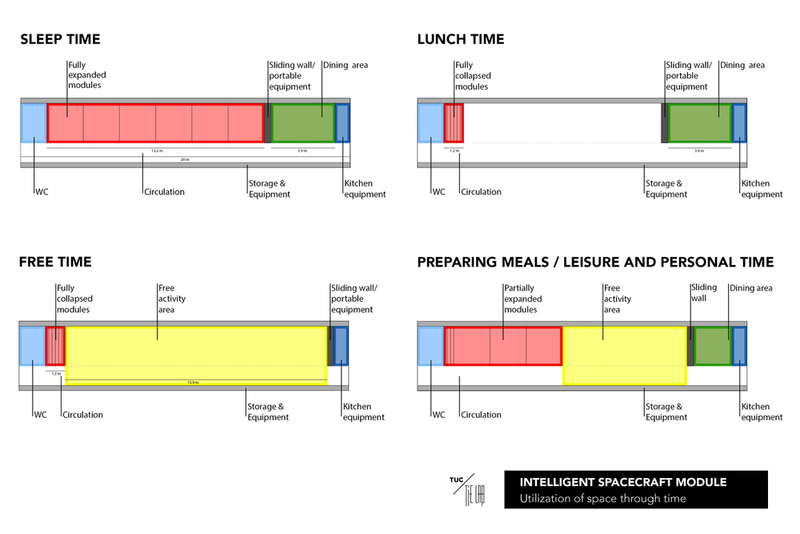 It focuses on the technical requirements and proposes approaches on how to achieve a spatial arrangement of the interior that addresses sufficiently the functional, physiological and psychosocial needs of the people living and working in such confined spaces that entail long-term environmental threats to human health and performance. Since the research perspective examines the issue from a qualitative point of view, it is based on establishing specific relationships between the built environment and its users, targeting people's bodily and psychological comfort as a measure toward a successful mission. This research has two basic branches, one examining the context of the system's operation and behavior and the other in the direction of identifying, experimenting and formulating the environment that successfully performs according to the desired context. 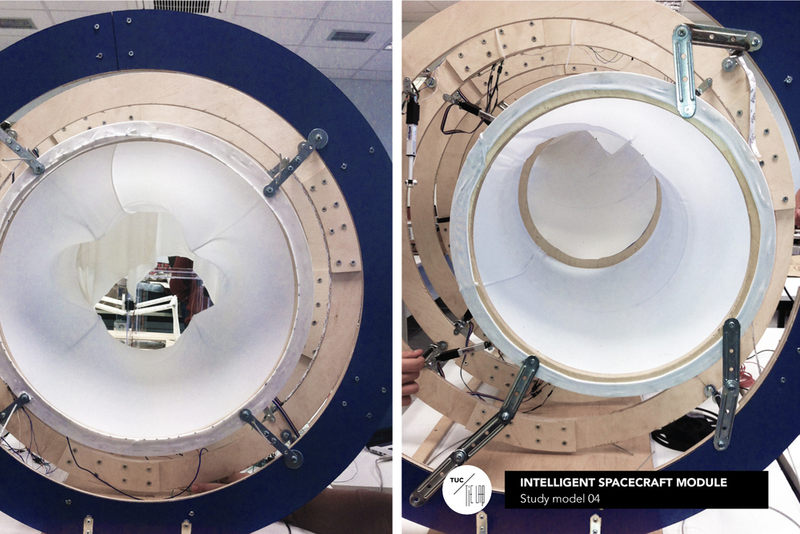 The latter aspect is researched upon the construction of a scaled-model on which we run series of tests to identify the materiality, the geometry and the electronic infrastructure required. 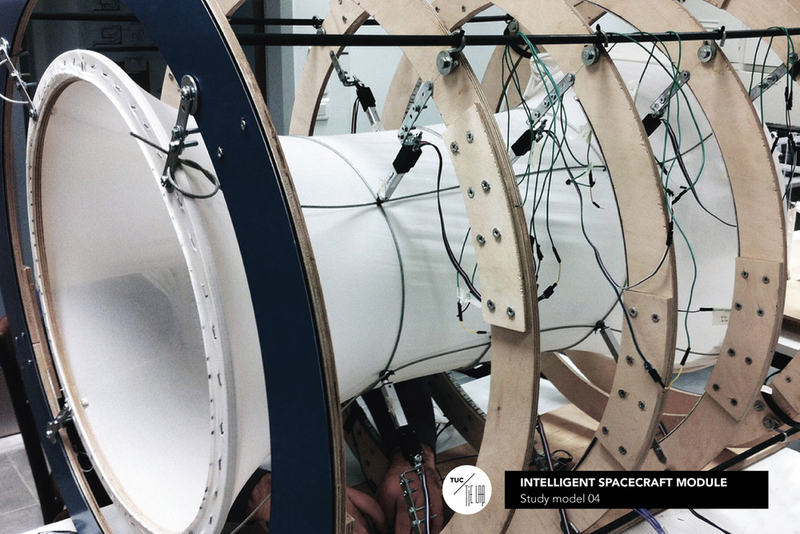 Morphologically, the project was inspired by Kas Oosterhuis's 1998 design proposal for a space station as well as by the turnOn project by Alles Wird Gut during 2000-2005. 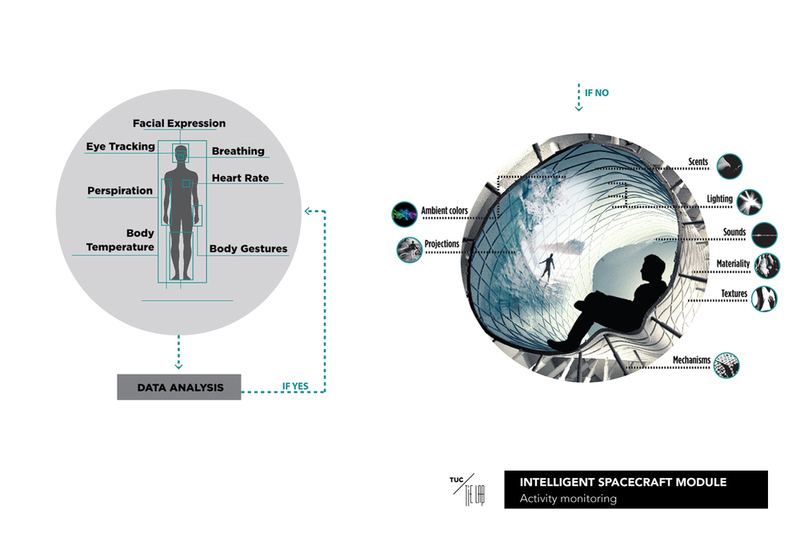 Guided by the principles of sensponsive architecture, the ISM research project explores the application of the necessary spatial arrangement and behavior for a user-centered, functional interior where the appropriate intelligent systems are based upon the existing mechanical and chemical support ones featured on space today, and especially on the ISS. 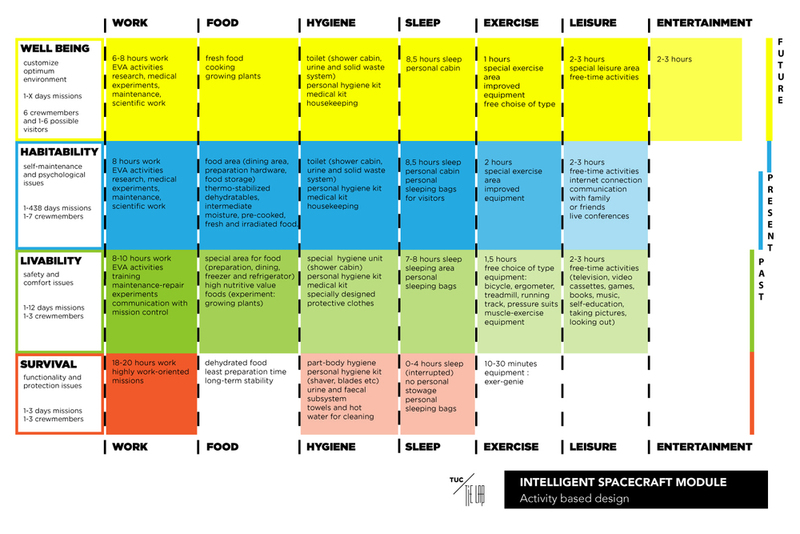 The problem is set according to the characteristics presented at the Mars500 project, regarding the living quarters of six crew-members, along with their hygiene, leisure and eating areas. Transformable design techniques introduce spatial economy, adjustable zoning and increased efficiency within the interior, securing at the same time precise spatial orientation and character at any given time. The sensponsive configuration is programmed to exhibit behavior in direct relation to human activity. It is based upon two active systems, the Activity Evaluation System (AES) and the Response System (RS), with combined action that is always open to the control of the user. 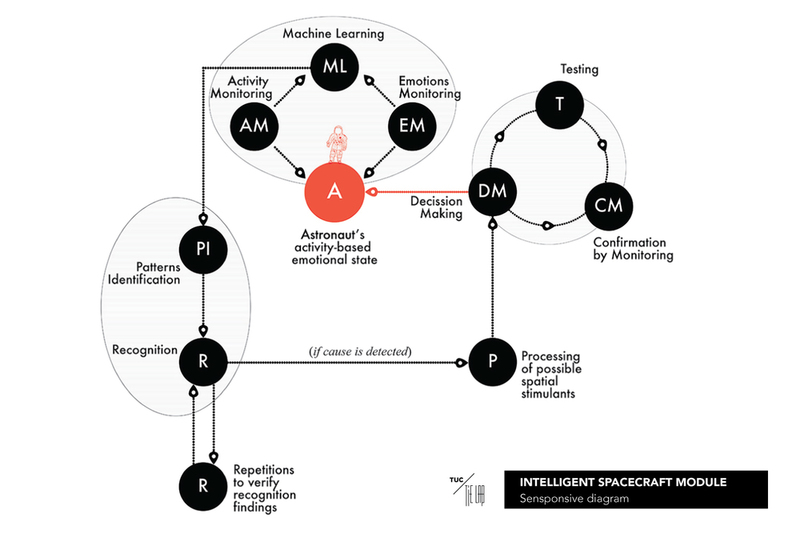 The AES monitors the daily schedule of the astronauts in order to find patterns of activity, understand the context of actions and moreover to assess the psychological condition of the crew-members. 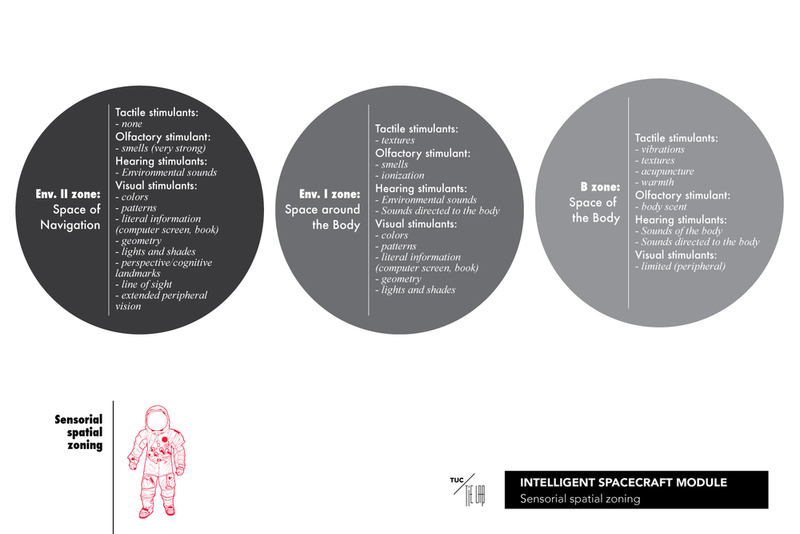 If it finds cause for intervention, AES will give way to the RS which employs smart materials, controllers and actuators in order to perform required changes in the environmental factors, both spatial (volume and surface) and ambient (audio, visual, olfactory, and haptic), and induce a desirable spatial and/or psychological condition that is beneficial for the astronauts' comfort and well being. 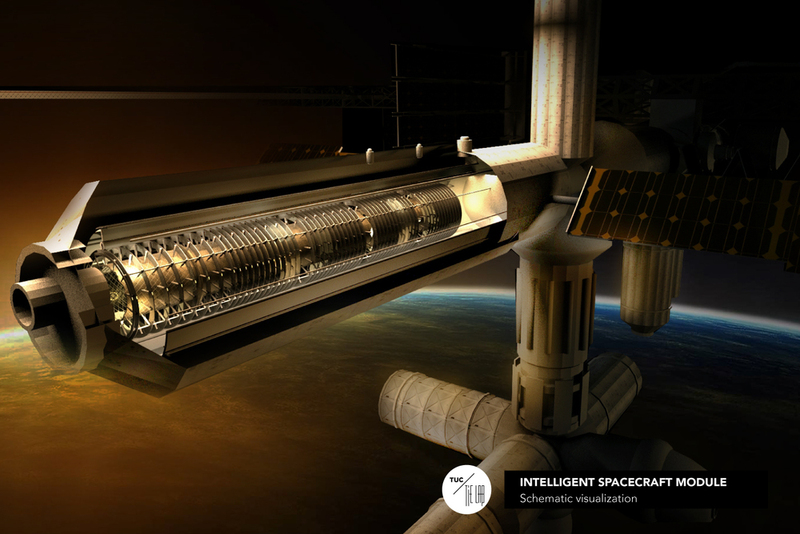 This is an alternative application path of the Intelligent Spacecraft Module (ISM), as a dual use element, including in its original operation the protection from radiation events. 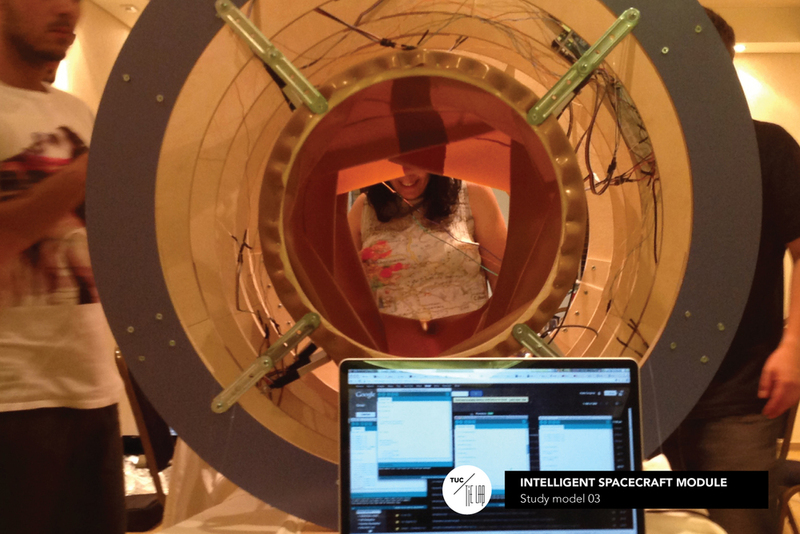 Elements of dual use are of higher value in space applications as they address multiple issues with a single installation. The ISM/RS type operates, in a day-to-day operation, as an interactive place for leisure and relaxation to mitigate stress and fatigue, and as a shelter for Solar Particle Events (SPE) and Galactic Cosmic Radiation (GCR) emergencies. This dual use renders the proposed module a valuable installation for issues regarding the physical and psychological health of the crew. 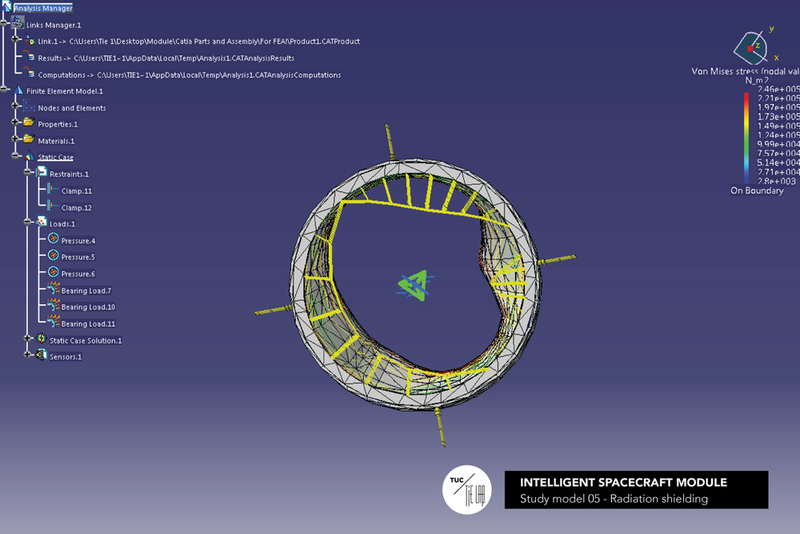 Our prototype was sectioned in multiple layers, thus providing in-depth analysis of every aspect through the computer program Catia® by Dassault Systems™. The materials and layering allocation were chosen by taking into consideration the criteria of weight, radiation shielding properties, durability and elasticity needed in each case. 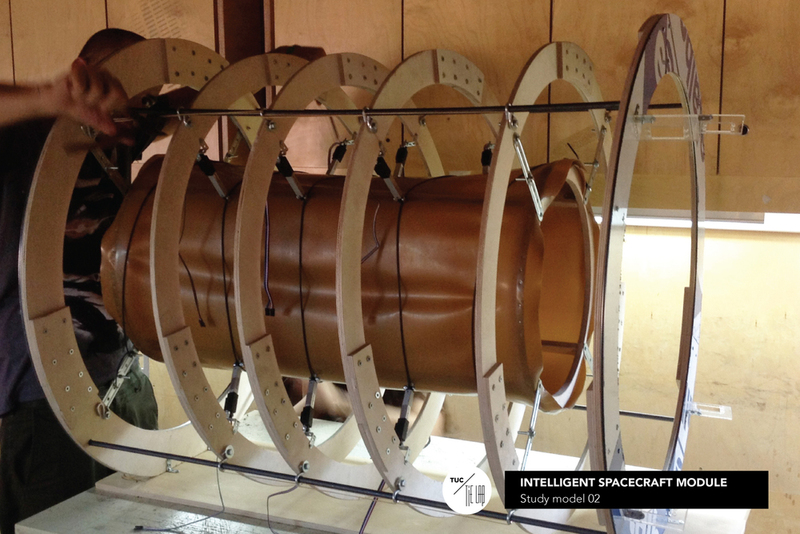 The suggested materials are commonly used in aerospace engineering. 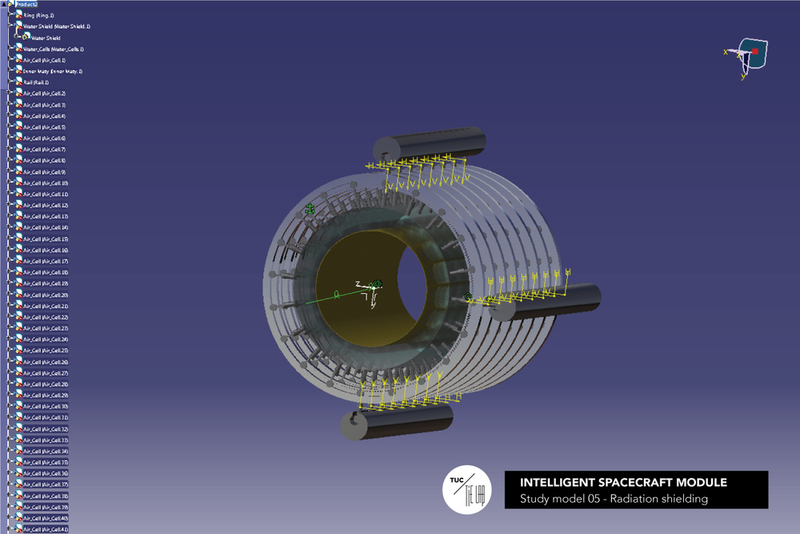 In order to increase the feasibility for application of such a proposal, we reduced the cost by employing the existing air water as the medium of actuation mechanisms, reducing that way the overall mass of the structure. The ability to regulate the pressure and the location of water in the cells, affecting the thickness of the 'water wall', can either accommodate better the utilitarian requirements or (in an emergency event) create customized shielding, addressing omnidirectional events or directional. The rest of the materials assigned as protective layers were chosen regarding the weight/protection level ratio. It is evident that the larger mass is the water’s, 5,67 cubic meters, but being an essential resource for the astronauts it does not count as additional weight. The ability to use either clear or gray/black, increases the efficiency of the unit. 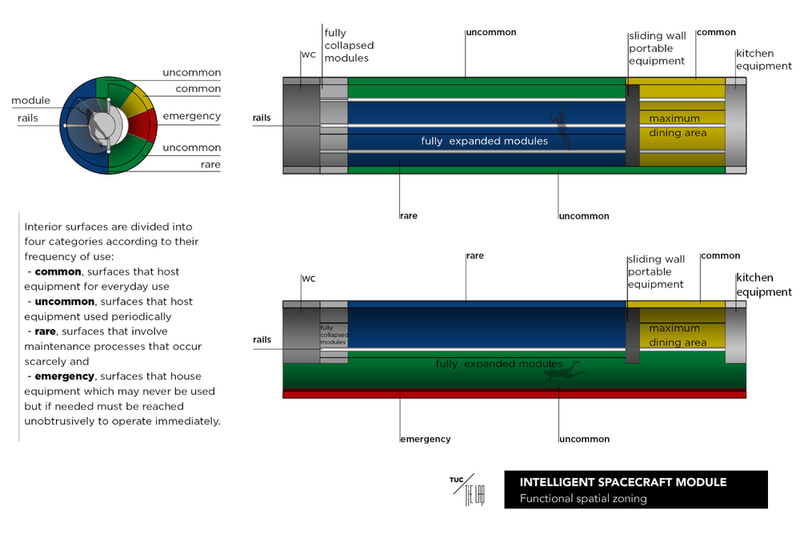 The element in this study that requires further inquiry is the secure closing mechanism of the module in the emergency operation. While it has been designed as a retracted surface that features all the layers assigned to the cylindrical surface, the exact mechanism and weight has not been clarified precisely and it is not calculated also. The exact amount of radiation protection is also estimated according to the available literature. For exact prediction of protection levels a series of tests are required to measure the efficiency. Moreover, the study explores the potential and necessary adjustments required for the ISM/RS to be fitted within different architectures of vehicles and habitats. 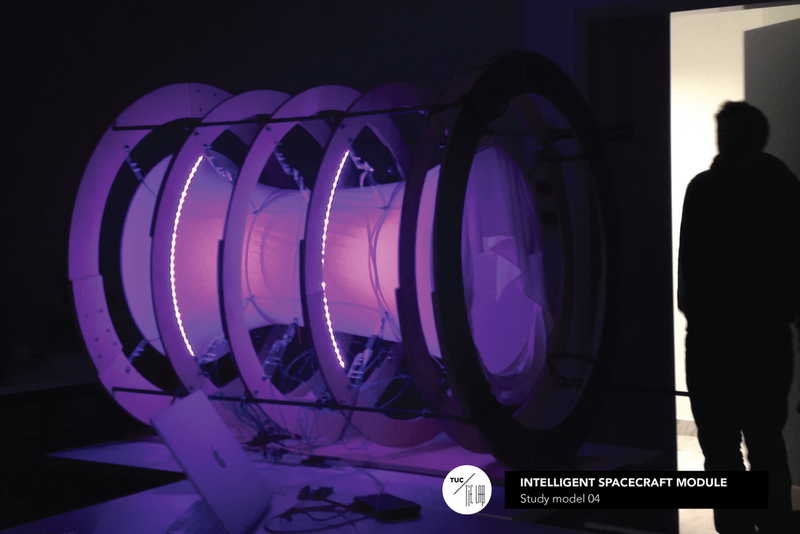 Since the module is conceptualized as an “add-on” to any kind of manned space environments, it must possess the ability to fit within a variety of volumes and to be adaptable to different levels of gravitational forces. 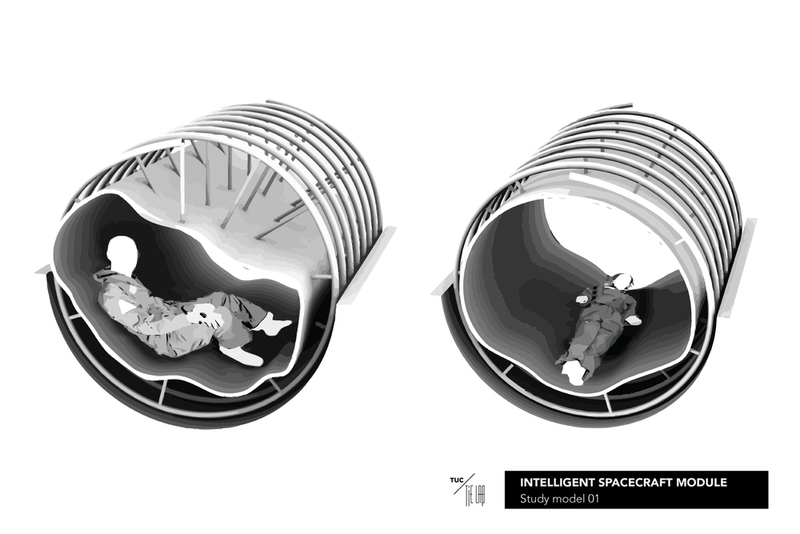 Four main scenarios are examined for LEO, very low gravity, low/medium gravity conditions, as well as, a scenario where the gravitational conditions change periodically. Oungrinis, K.-A., Liapi, M., Kelesidi, A., Gargalis, L., Telo, M., Ntzoufras, S., Paschidi, M. (2014). 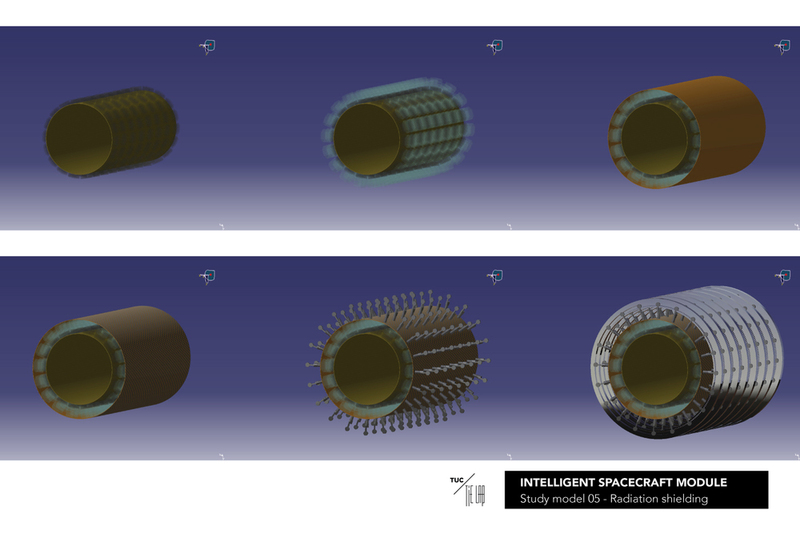 Intelligent Spacecraft Module. Acta Astronautica 105(1), Elsevier, 242-253. Oungrinis, K.-A., Liapi, M., Linaraki, D., & Mairopoulos, D. (2013). Affecting emotions with sensponsive design. 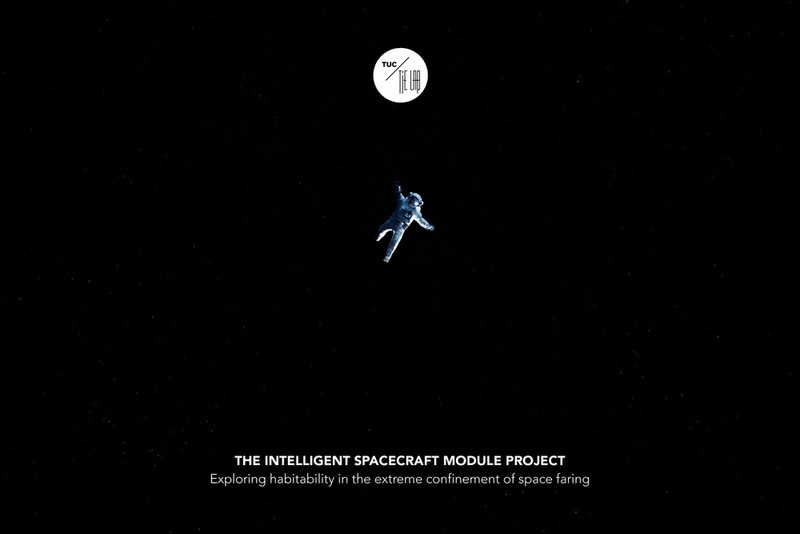 A habitable spacecraft module experiment. In: Proceedings of the 9th International Conference on Intelligent Environments (IE). Washington, DC, USA: IEEE Computer Society, 30-36.